The Three Stages of the Scorpio Zodiac: the Scorpion, the Eagle, and the Phoenix. 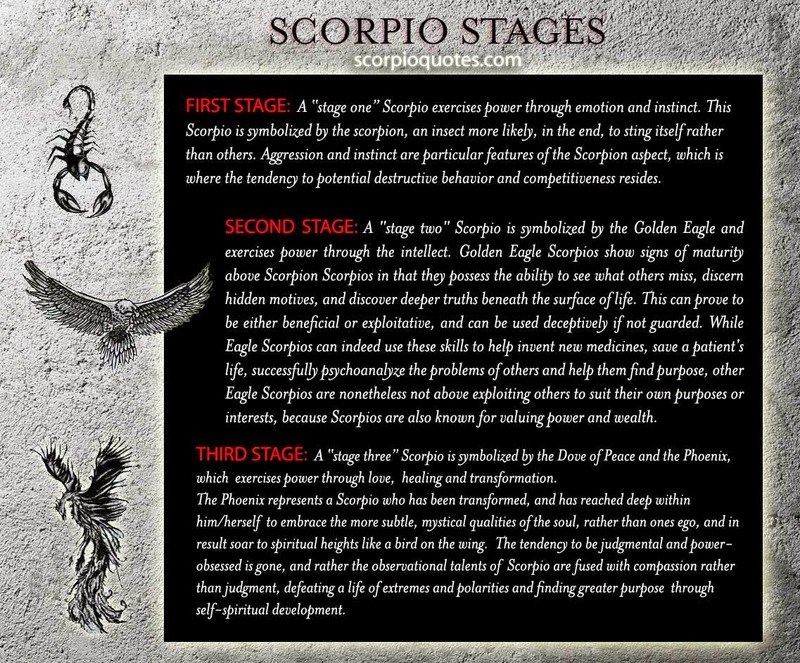 First Stage of Scorpio: The Scorpion Scorpio - A “stage one” Scorpio exercises power through emotion and instinct. This Scorpio is symbolized by the scorpion, an arachnid more likely, in the end, to sting itself rather than others. Aggression and instinct are particular features of the Scorpion aspect, which is where the tendency to potential destructive behavior and competitiveness resides. Second Stage of Scorpio: The Eagle Scorpio : A "stage two" Scorpio is symbolized by the Golden Eagle and exercises power through the intellect. Golden Eagle Scorpios show signs of maturity above Scorpion Scorpios in that they possess the ability to see what others miss, discern hidden motives, and discover deeper truths beneath the surface of life. This can prove to be either beneficial or exploitative, and can be used deceptively if not guarded. While Eagle Scorpios can indeed use these skills to help invent new medicines, save a patient's life, successfully psychoanalyze the problems of others and help them find purpose, other Eagle Scorpios are nonetheless not above exploiting others to suit their own purposes or interests, because Scorpios are also known for valuing power and wealth.